Come join the Mississauga Writers Group at 2017 Doors Open Mississauga at Sampradaya Dance Centre www.sampradaya.ca. From 10am - 4pm. There will be guided tours of the studio rooms and stage area. Our group will be their special guests from 2-4 pm for readings and people can speak with the writers. Come join the Mississauga Writers Group from 10 am to 4 pm at Culture Days Mississauga at the Mississauga Central Library. In the atrium, there will be authors and on the third floor there will be readings and writing workshops. 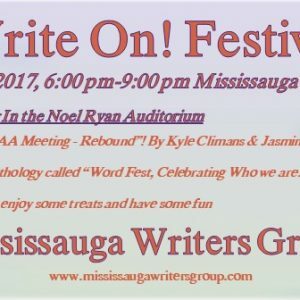 Mississauga Writers Group.